More and more men starting to put more efforts on their outlook, skin and appearance so called metrosexual. But I still find some lazy bums who only use bath soap for their face and body. There is a reasonable price, decent and easy skincare for men. When it comes to their lives, men want to be in control, whether it is their careers, personal achievements or relationships. 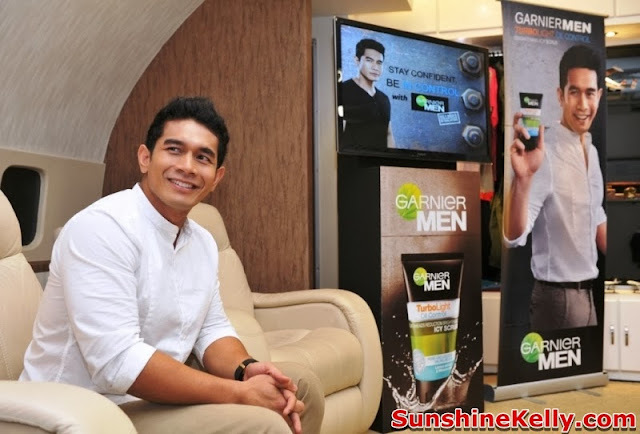 Garnier Men Be in Control an interview session at SimFlightKL at Subang Skypark Terminal, Sultan Abdul Aziz Shah Airport with Garnier Men Brand Ambassador Fahrin Ahmad. He shared about his concept of control and how he applies it to his everyday life. Not only that, pilot – Captain M. Danial Tajuddin that uses control not only for his challenging career but also for other important aspects of life like his relationships and his everyday routine that includes grooming. Garnier Men’s best-selling range Turbo Light Oil Control, a skincare range formulated for men with oily and dull skin, Garnier Men Turbo Light Oil Control helps to regulate sebum production, addresses the problems of dullness, and hydrates skin while keeping it shine-free and sweat-free for hours. Ahmad Fahrin was appointed by Garnier Men as its brand ambassador in Malaysia in 2010. With his friendly, approachable, active and healthy lifestyle, Fahrin embodies the values that Garnier Men finds important. 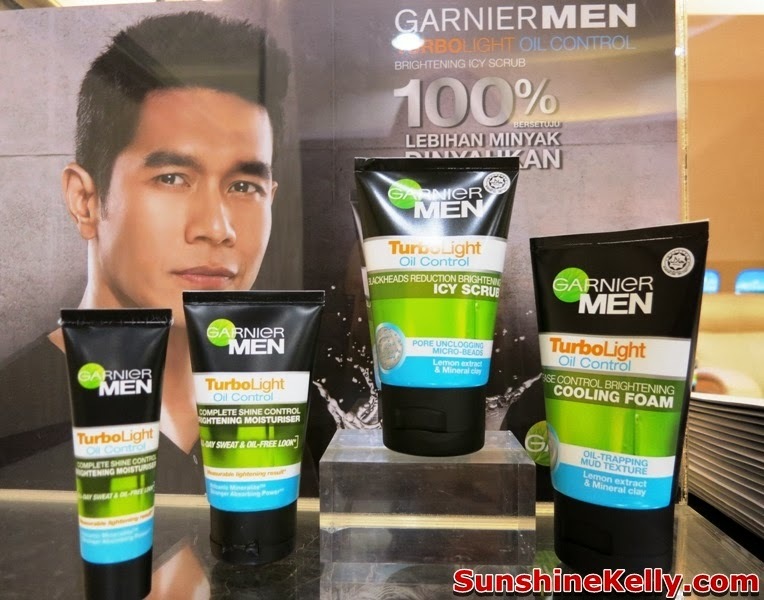 When asked to relate this sense of control to his skincare regime, Fahrin shared that with Garnier Men Turbo Light Oil Control, he is able to keep his oily skin in check. Garnier Men Turbo Light Oil Control, which was launched January 2010, is Garnier Men’s best-selling range. It is formulated to target oily and dull skin by clearing pores of dirt, impurities, pollution and excess oil from deep within so that skin takes on a completely shine-free and sweat-free appearance. Garnier Men Turbo Light Oil Control is now available at all leading retail outlets. Garnier Men Turbo Light Oil Control is formulated with the signature Garnier pure lemon extract that helps to brighten and even out skin tone. It also contains oil-absorbing mineral clay to regulate excess oil, salicylic acid to purify skin and reduce imperfections, as well as cryo-menthol to give men that soothing and cooling after effect. Garnier Men Turbo Light Oil Control is a complete range of products targeted for men with oily and dull skin. Garnier Men Turbo Light Oil Control Grease Control Brightening Cooling Foam price at RM7.90 for 50ml; RM14.90 for 100ml - leaves skin refreshingly cool after use. For a deeper cleansing effect. Garnier Men Turbo Light Oil Control Icy Scrub price at RM7.90 for 50ml; RM14.90 for 100ml - easy-to-use facial scrub formulated with pure lemon extract to visibly reduce blackheads. Garnier Men Turbo Light Oil Control Complete Shine Control Brightening Moisturiser price at RM9.90 for 20ml; RM19.90 for 40ml – moisturize skin and shine control with its pure lemon extract and oil-regulating minerals. Garnier Men Turbo Light Oil Control Charcoal Black Foam price at RM8.50 for 50ml; RM15.90 for 100ml - first cleanser formulated for men with a unique “Dirt Magnet” effect that helps to trap out and dissolve dirt, pollution, impurities and excess oil to purify and brighten skin with its ingredient, natural charcoal.